The MyChron4 660 is the successor to the best selling MyChron3 660. With the MyChron4 all of the data are easily downloadable to your PC thanks to Data Key, a compact interface that collects data from MyChron4 660 after the run and transfers them to the PC through a USB connection, ready to be analyzed. No more balancing your laptop on the roll cage while trying to read the screen in the bright sunlight. The data comes to your computer. 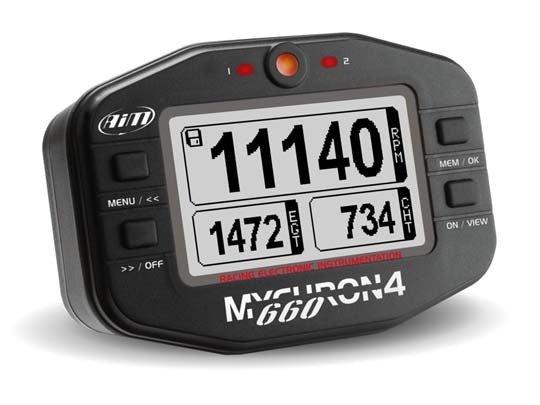 MyChron4 660 includes an RPM display stabilizer automatically invoked below 5000 RPM. The RPM stabilizer will average the engine RPM on the display. The result is a much more steady and consistent number for your carburetor tuning. In the real time view, the Engine RPMs are displayed as large digital numbers, smooth and steady. You can also see both your cylinder head temperature (CHT) and your exhaust gas temperature (EGT). MyChron4 660 has an internal clock and calendar to time and date stamp every run. At the touch button, you'll get your maximum engine RPM, maximum jackshaft RPM, maximum temperatures, total recorded runtime and much more. With MyChron4 660 you’ll get a clear, graphical display of engine and jackshaft RPM, Exhaust Gas Temperature, Cylinder Head Temperature, and even CVT ratio, overdrive amount and calculated wheel speed in MPH. Run data can be extensively analyzed on your computer using QMAn, the powerful software application specifically developed by AIM for this data logger. QMAn lets you create your personal ET database and analyze performance data with built-in features like histograms, scatter plots, and even colored 3D plots. It's even more user friendly than before, minimizing the number of clicks to get to the information you need. When you purchase one of our MyChron4 660 data recorders, you will be able to send us actual run data on your McGee Cams engine combination. This will make it much easier for us to help you tune your engine for the specific conditions found where you race.